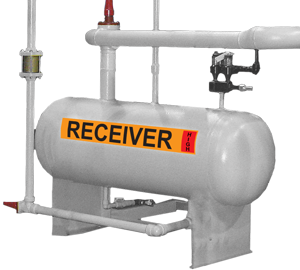 Stick-On Ammonia Markers are industrial strength vinyl labels designed to function at a service temperature up to 200° F or less. Markers will stick to a variety of insulated surfaces and comply with the Recommended Guidelines of IIAR Bulletin 114 2014 Revision. Each marker is supplied with an arrow that can be applied in any direction. Clean, dry surface and 50° F is required for application. 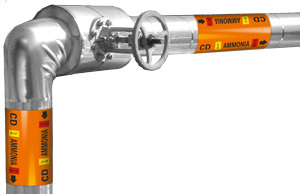 Ammonia System #4 Pipe Markers™ are designed to withstand harsh chemicals and weather all environments. High temperature resistance to 248° F. The printed legend is laminated between two layers of polyester, creating an extremely DURABLE product. Sizes AR4B thru AR4F coil around the pipe and are secured in place by the overlapping adhesive strip. Size AR4H is constructed with two layers of polyester that are then laminated to a heat resistance carrier that is applied to the pipe with stainless steel strapping. EZ Ammonia Component Markers are part of the Recommended Guidelines of IIAR Bulletin #114 2014 Revision. These industrial strength vinyl labels will stick to a variety of insulated and non-insulated (clean and dry) surfaces, with a service temperature up to 200° or less. 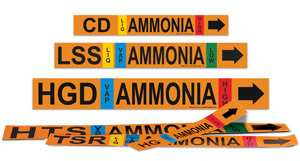 Ammonia Reference Chart: If your personnel is not familiar with the many abbreviations and ammonia marker layouts, display this chart wherever ammonia markers are used. Chart defines letter abbreviations and colors codes.